Readers of this column already know that my passion is the story behind the cover. 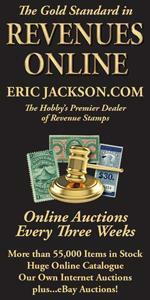 But some of the most intriguing items are stamps found with contemporary notes on them, such as those illustrated here. 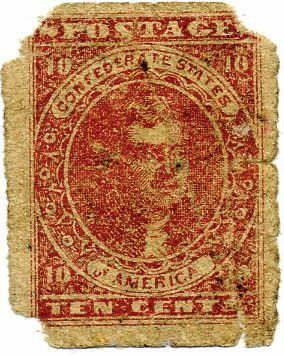 The first is a Scott CSA #5, a scarce unused 10¢ rose and a faulty stamp, but with a wonderful note on the back “Taken from the pocket of a Confederate soldier dead on the battlefield of Stone(s) River”. This certainly brings the War full into perspective. The Battle of Stones River, also known as the Battle of Murfreesboro, was fought from December 31, 1862 to January 2, 1863 in Middle Tennessee. Of the major battles of the Civil War, Stones River had the highest percentage of casualties on both sides. Total casualties in the battle were 23,515: 13,249 on the Union side and 10,266 for the Confederates. This was the highest percentage of casualties of any major battle in the Civil War, higher in absolute numbers than the famous bloodbaths at Shiloh and Antietam earlier that year. A second example of such a notation appears on an unused Scott CSA #11c, 10¢ greenish blue right sheet margin pair with a contemporary notation in the margin, “Sent home from the South 1863 by J Beecher New Haven”. 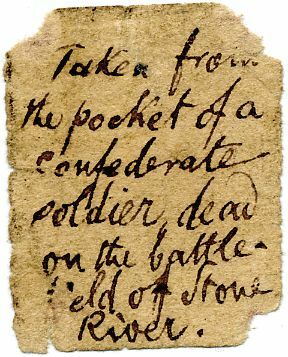 That bit of information sent me to the military records and I was fortunate enough to specifi cally find only two soldiers with the name of J Beecher from Connecticut and only one from New Haven, which pretty authoritatively pegs it as the right person. Jeremiah B. Beecher of New Haven, CT enlisted on August 11, 1862 as a private. On August 25th he mustered into Company “E” of the 15th Connecticut Infantry, the day it was organized, and mustered out on June 27, 1865. He was listed as a prisoner-of-war March 8, 1865 at Kinston, NC and was paroled a couple weeks later on March 26th , place not stated. The 15th was known as the “Lyons Regiment” and participated in many notable battles such as Fredericksburg. They were variously part of the Army of the Potomac, Department of Virginia and North Carolina and Department of North Carolina. Most of their movements in 1864 and 1865 were in the area of New Bern, Plymouth and Kinston, NC. Records show the 15th as occupying Kinston on March 14, 1865, only a week after Beecher’s capture at what was known as the Battle of Southwest Creek, as there was a first Battle of Kinston earlier on December 14, 1862. The 15th performed provost duty at Kinston and New Bern until June 1865. During the war, 1,617 men served. Although I found conflicting data, one important source shows that the regiment lost four offi cers and thirty-four enlisted men who were killed in battle, as well as fi ve officers and 142 enlisted men by some form of disease for a total of 185; fourteen died in Libby Prison. Jeremiah Beecher was clearly one of the lucky ones.